A high powered modified engine tends to generate excessive blow-by oil and gasses. In these cases, an ordinary small catch can may quickly fill with oil and not be adequate. 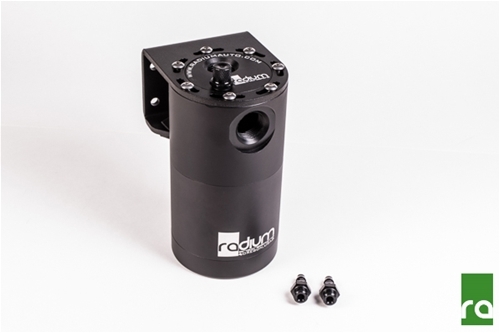 Like the Radium Engineering Catch Cans, the AOS (Air Oil Separator) kit is responsible for keeping blow-by oil and other pollutants out of the air intake and intercooler (if equipped) systems. The main difference is that an AOS system returns collected oil back into the oil pan so there is no servicing required. -In order for the AOS to function properly, a port must be supplied on the engine for the oil to return through. -The AOS must be mounted high enough in the engine bay so that the port on the bottom is higher than the oil return port on the engine. -Engine coolant must be available to be routed to AOS in order facilitate heating it so that it functions correctly. CLICK HERE for a list of fittings offered that are compatible with the AOS's -10AN ORB port. Without a properly designed AOS, water condensation can develop and find its way in the oil pan contaminating engine oil. Engine coolant lines are routed through the Radium Engineering AOS in a specially designed heating chamber (shown above). This keeps the AOS warm and prevents water from condensing inside. Because water is more dense than oil, there is an integrated water trap found around the bottom perimeter that prevents condensation from descending into the oil pan. 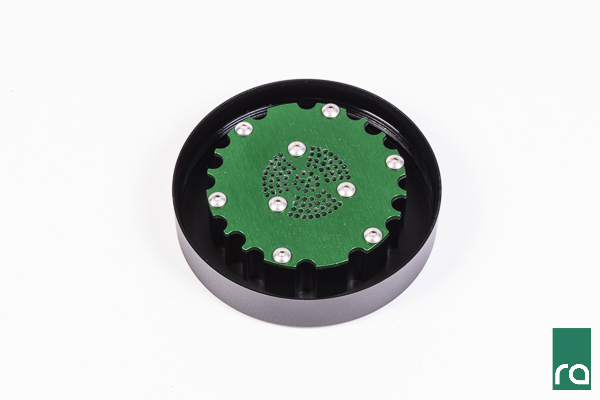 For AOS crankcase plumbing, the valve cover vent(s) are routed into the top inlet where the stainless steel condensing material separates the oil from the gasses. The filtered liquid oil is collected at the bottom of the AOS and drawn into the oil pan. Meanwhile, the clean crankcase air can either be vented to atmosphere (VTA) or recirculated to the turbo air inlet pipe. Shown below is a plumbing example. With a properly operating system, the fluid level inside the AOS will be empty after sitting. If there is a possible return obstruction, simply unscrew the anodized billet aluminum dipstick for inspection. Conversely, the entire billet unit disassembles into 3 large pieces for servicing. -Prevents oil buildup in the intake or intercooler system walls, throttle body, intake manifold, etc.